Continues the Patents Project by examining the life and impact of the inventor of the Clock System map and rural directory. An engaging look at the power of maps in American politics. How maps help people avoid and officials plan for disasters. Article in The International Encyclopedia of Geography: People, the Earth, Environment, and Technology (2017). Published on ResearchGate.net (11 January 2016) and Academia.edu (13 January 2016), DOI: 10.13140/RG.2.1.3332.7126. Published on ResearchGate.net and Academia.edu, 17 January 2016, DOI: 10.13140/RG.2.1.1235.5605. Glimpse: the art + science of seeing, no. 8 (Autumn 2011): 14-21. In the next century, sea levels are predicted to rise at unprecedented rates, causing flooding around the world, from the islands of Malaysia and the canals of Venice to the coasts of Florida and California. These rising water levels pose serious challenges to all aspects of coastal existence—chiefly economic, residential, and environmental—as well as to the cartographic definition and mapping of coasts. It is this facet of coastal life that Mark Monmonier tackles in Coast Lines. Setting sail on a journey across shifting landscapes, cartographic technology, and climate change, Monmonier reveals that coastlines are as much a set of ideas, assumptions, and societal beliefs as they are solid black lines on maps. Whether for sailing charts or property maps, Monmonier shows, coastlines challenge mapmakers to capture on paper a highly irregular land-water boundary perturbed by tides and storms and complicated by rocks, wrecks, and shoals. Coast Lines is peppered with captivating anecdotes about the frustrating effort to expunge fictitious islands from nautical charts, the tricky measurement of a coastline’s length, and the contentious notions of beachfront property and public access. 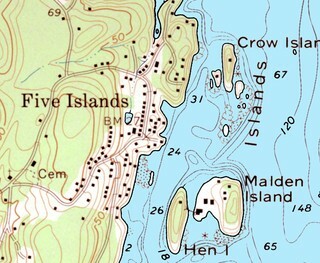 Five Islands, Maine, as shown on the U.S. Geological Survey's Boothbay Harbor 7.5-minute topographic map, published in 1979. Topographic maps emphasize features on land. 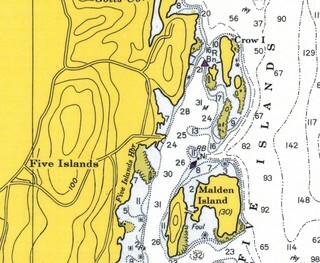 Five Islands, Maine, as shown on U.S. Coast & Geodetic Survey chart 238, Kennebec and Sheepscot River Entrances,published in 1970. Coastal charts emphasize shoreline features and hazards to navigation. Vicinity of Ocean City, Md., from U.S. Coast & Geodetic Survey chart 1220, published in 1920. Note that the barrier island is continuous--or was, until 1933. 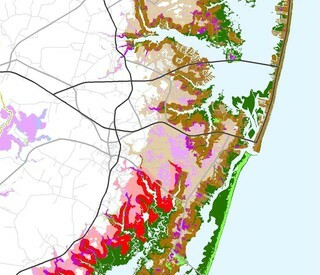 EPA sea-level-rise planning map for Worcester County, Md. shows the westward migration of the barrier island south of the Ocean City inlet, opened by the severe 1933 hurricane, which also took out the railroad shown on the 1920 map. Ocean City, north of the inlet, has been stabilized by costly shoreline-protection measures. But south of the inlet, the unprotected Assateague Island National Seashore has responded to erosion and rising seas by moving toward the mainland. 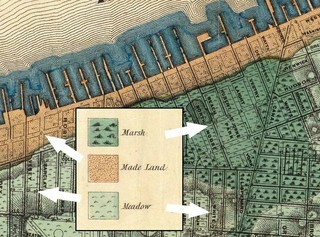 Portion of the New York shoreline near what's now Tribeca, from Egbert Ludovickus Viele's 1865 Sanitary and Topographical Map of the City and Island of New York. Light orange on this hand-colored map shows fill behind the bulkhead along the Hudson River. Storm-surge maps, like this one from the New York State Emergency Management Office, show hypothetical shorelines associated with severe coastal storms. ". . . delivers information in a knowledgeable and entertaining manner."